July | 2012 | Purpose Based Learning – Education for Now! Purpose Based Learning – Education for Now! Research Group, consisting of year 2-6 students Josh, Matthew, Luke, Aiden, Riley, Connor, Sierra, Molly, Marlena, Darby, Willow and Ken has been a real blast as they explored the physics of rocketry along with participation in the GRAIL Moonkam project in which the students sent requests for photos to two satellites orbiting the moon and then downloaded the images. Research Group is focused on extending each student’s academic ability through the use of the higher order skills of creating, evaluating, analysing and applying as expressed through Bloom’s Taxonomy. Rocketry focused on students exploring the mechanics of how rockets work and then through the building their own air/water powered bottle rocket which was then tested for optimal flight using differing amounts of water. GRAIL Moonkam has been an opportunity for students to log into the Moonkam site and upload photo requests of specific sites on the moon based on day/night passes, orbits, camera position and latitude and longitude. A great number of photo requests were successful. All students have been given a class for which they are currently preparing a presentation. Well done to the group and we’ve had fun as we’ve tested and re-tested, made and re-made and explored the scientific world! 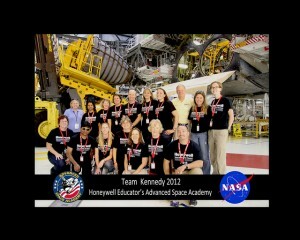 Well I have just returned from an amazing, stimulating and highly rewarding experience at the Honeywell Advanced Educators @Space Academy at the US Space and Rocket Centre in Huntsville, Alabama. 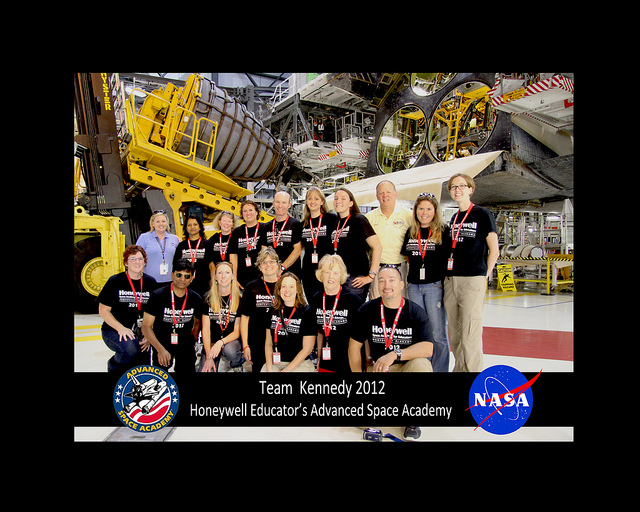 I first attended Honeywell Educators @Space Academy in 2010 and a review is on this blog. When I was selected to attend the Advanced course this year I was excited and eager to join fourteen other middle school teachers who have a similar passion and interest in not only space and science education but in learning itself. During ten days we participated in a range of team and confidence building activities such as the ‘Pamper Pole’ climbing and trust ropes course, space briefings on the shuttle program and future NASA directions such as the Space Launch System (SLS), multiple simulated missions, scuba in the Underwater Astronaut Trainer, sessions with astronauts and visit to the Kennedy Space Centre. Kennedy was a real highlight for everyone and after the twelve hour bus ride we couldn’t wait to visit launch pad 39 and the Orbiter Processing Facility where we stood under the Atlantis during its decommissioning. This is something special for anyone interested in space exploration and NASA achievement. Finishing off with Lego Mindstorm Robotics was a rewarding finale and for someone with little robotics experience like myself was valuable and enjoyable professional learning. While that’s a summary of activities the intangibles of a program like this are what really matters. When you put fifteen like-minded passionate, curious, creative, geeky and crazy teachers together for ten days great things happen. 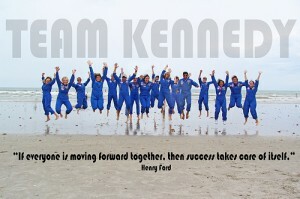 We talked, shared, supported, encouraged and worked as true team for the entire period. We took risks and laughed and cried at successes and failures…. we all need both to learn and grow, as do our students and we should all continually be pushing and stretching forward in the pursuit of learning. So now as the new school term commences I’ll be looking to incorporate and grow school programs in rocketry and robotics and through those themes expose our students to the deep learning and quality teaching that comes with investigation and design, test and re-test and collaborative inquiry based learning. Thank you Honeywell, the USA Space and Rocket Centre, NASA and especially the wonderful people of Team Kennedy (and our leader Dan who kept us on track and out of trouble!). Mount Ousley PS – An example of futures and digital learning! Primary Science Matters – Podcast with Fizzics Education.